Send your sweetheart romantic messages on New Year’s Day to remind her or him about your love. All I truly wish is to start the New Year in your arms and seal my undying love with a kiss. This New Year I wish to be the smile on your lips, the wind in your hair, the sparkle in your eyes, the love in your heart – I just want you to keep me close, just as I keep you in my soul. On this New Year’s Day, I wish that we may walk all the paths of life hand in hand giving strength to each other, supporting each other through our love. I dreamed of someone who would complete me … then one day I opened my eyes to find You stepping into my life making my dream come true. Happy new year, my dear! Your love has already made my life a magical one. So, as New Year starts, my humble tribute to you are three simple words – I love you. No winter wind can keep away warmth from filling up my heart as I look forward to start a brand New Year with you as my love. My most precious wishes came true the day I met you and I feel so blessed. May the New year bring us more happiness, more joyful moments and the fortitude to face all challenges together. I love you, my dear. This New Year I promise to fill each coming day with loving memories to store them in your heart forever. My New Year gift for you: my heart wrapped with love and passion. I hope that you will treasure it for many years to come! This New Year God sent an Angel my way to make the world a blissful place for me to be in, and that Angel is You! No distance could ever keep me from reaching out to you to embrace you, to kiss you and wish you a Happy New Year. With you by my side, I know for sure that I shall have a fabulous New Year. You are my Good Luck Charm, my Guardian Angel. Your beautiful sight heals my wounds, your smile cures my ailments, your touch rejuvenates my spirits. All I truly need to face the New Year. New Year is the perfect time to celebrate all that one cherishes … I celebrate you and our relationship. I love you, honey. May our love give us the strength to overcome each and every darkness, and make beautiful beginnings together this New Year. 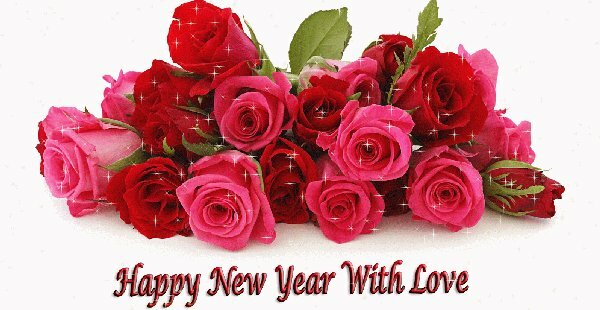 My only wish this New Year is that may our love grow in leaps and bounds and never face any obstacles.